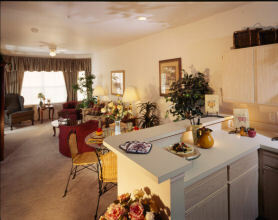 Country Lane offers a variety of floor plans with full size kitchens and name brand appliances. Each apartment unit was professionally designed to insure complete mobility and accessibility. These large apartment units make the perfect retreat! Country Lane & Grand Reserve apartment units available to senior citizen families with annual income less than $33,300 for a one person family and $38,040 for a two person family. Grand Texan apartment units available to senior citizen families with annual income less than $27,750 for a one person family and $31,700 for a two person family. $ 750 for two pets total weight under 35 lbs. Rent Late Fee: $ 35 for the first day, $10 every day after the first day up to 15 days. Non-sufficient funds are $ 40. No transfers will be considered until resident has fulfilled a one-year lease. Management reserves the right to approve a request for a transfer. $50 per month (market units only). Occupancy at Country Lane Campus is restricted to at least one person 55 years of age or better. Country Lane Campus is able to provide affordable housing to seniors through participation in an affordable housing program administered by the Texas Department of Housing and Community Affairs. Income limitations apply to affordable housing units.